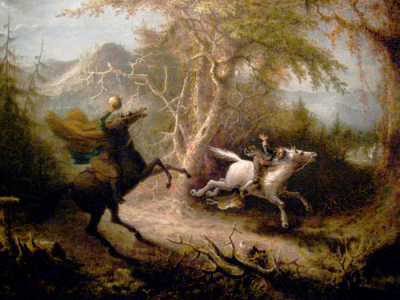 The classic Washington Irving tale comes to life in the form of Sleepy Hollow, a Musical Tale. For a short time, a musical adaptation of the timeless and supernatural Washington Irving tale, "The Legend of Sleepy Hollow," is coming to the Erie Playhouse YouTheatre stage. Sleepy Hollow, a Musical Tale is a spooky adaptation of the original short story "The Legend of Sleepy Hollow" by American author Washington Irving, contained in his collection of essays and short stories titled The Sketch Book of Geoffrey Crayon, Gent. The musical starts in present day, when, on Halloween night, three kids decide to go trick-or-treating at the old "Crane House," not knowing what is in store for them once they step inside. It is there that the cast is magically transported back in time into the late 1700s, bringing to life the classic tale involving Ichabod Crane and the Headless Horseman. The kids encounter both frightening and funny experiences, which help them learn to cope with life during that time period, but more importantly, how to find a way back home. The musical runs for two weekends only – October 17-19, and 24-26 at the Erie Playhouse, 13 W. 10th St. For more information or to purchase tickets, call 454.2852 or go online to erieplayhouse.org.